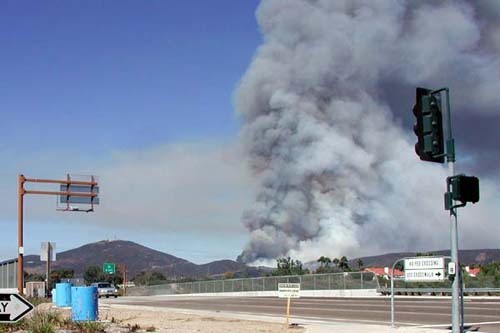 We were exiting the beach parking lot at 3 pm and looked east for the first time all day when we saw it: a plume of black smoke rising out of Penasquitos, 8 miles away. 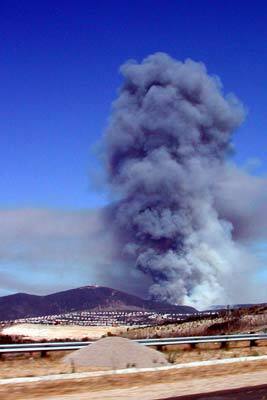 The mountain behind our house was on fire. Driving home from the west on Highway 56 we get multiple perspectives on the fire. 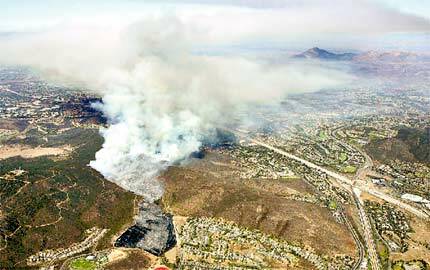 Thank goodness they are plowing up all the open spaces, grading it, and putting houses with fire resistant lawns where chaparral used to grow. 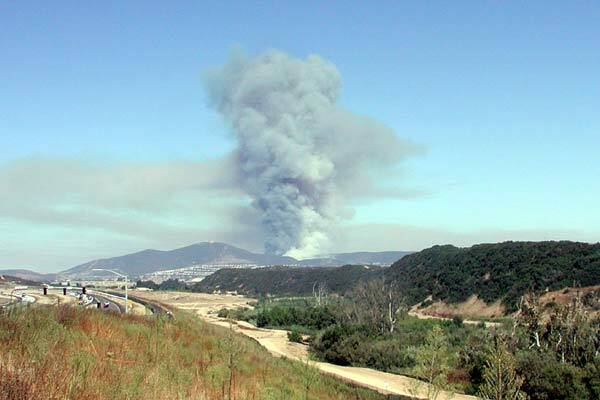 Arriving in Penasquitos south of the fire, we had perspective that wasn't available from the west. 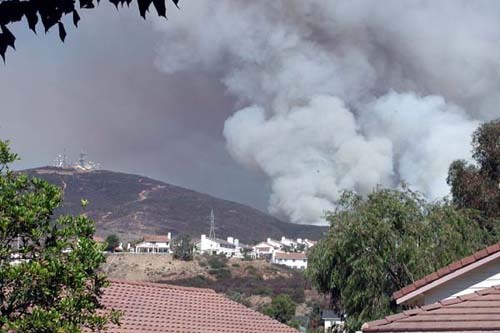 We now understand where the fire is, and that our house, to the west of the mountain (out of frame left) is not in apparent danger. 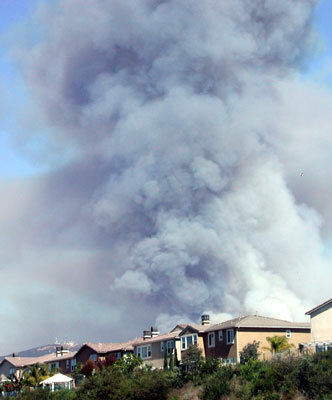 Sure, our neighborhood wasn't evacuated and the fire was never moving our way, but it was just a little over a mile away, and big and scary. 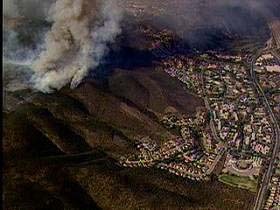 Aerial photos and a map from the San Diego Union-Tribune of the fire. Our house does not appear in either picture, but I did add it (in blue on left hand side) to the map. 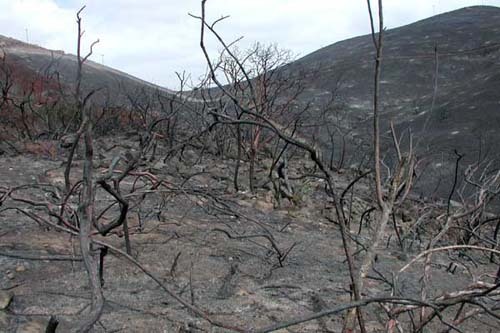 Some weeks after the fire, I rode my bike around the Black Mountain Open Space Preserve and took the following pictures from "inside" the fire. The roads that are bike paths meander all around the Black Mountain Open Space Preserve. 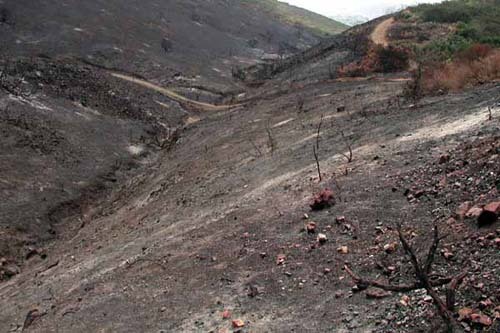 Here the unburnt section I am on leads directly to a denuded hillside. Moonscape from heart of the fire zone. 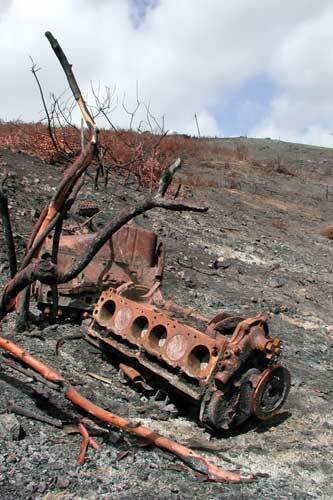 Things long hidden in the chaparral were revealed, as long as they themselves were not combustible, like these two internal combustion engines. 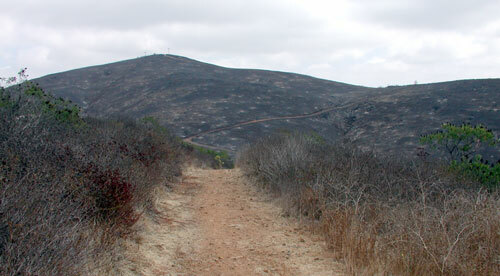 In addition to the trails criss-crossing the burt area, they were also obviously used for fire breaks. Note the trail in the upper right hand corner is burnt to its right (camera left). I conclude this path that I now bike on at the summit of this little ridge was pressed into service as a defensible fire break. 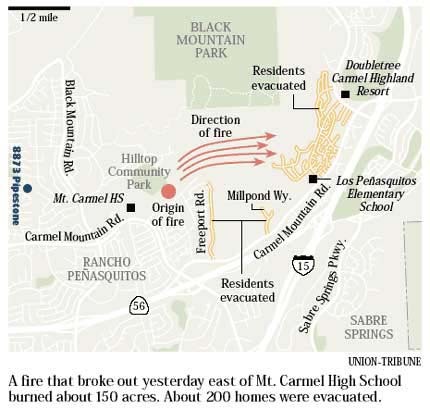 The fire started behind the high school (Mt Carmel, not the high school the boys will be attending). 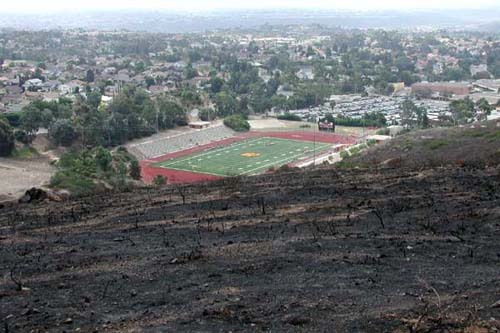 This then would be near the start of the fire, looking back towards the football field.